Race, class and culture are integral aspects of any clinical treatment; they particularly impact the treatment of addictive disorders. Just recently we have seen the repeal of the Rockefeller Drug Laws, the implementation of Mental Health Parity and National Health Reform. The country is in economic crisis, and we are in the midst of political sea change. We will examine how these issues impact drug users and problematic drug use, and how they enter into the clinical situation, especially as expressed in transference and counter-transference experience. The conference is designed to help clinicians better address issues of race, culture and politics in their work with substance users. In case Montel Williams wasn't already sufficiently pissed off about the government's war on his medicine, yesterday's incident is sure to push him over the edge. TV celebrity Montel Williams was cited at Mitchell International Airport on Tuesday for carrying a pipe commonly used to smoke marijuana, the Milwaukee County sheriff's office reported. Williams, 54, was issued the citation for possession of drug paraphernalia after being caught with the pipe by Transportation Security Administration agents while going through a security checkpoint, a news release from the sheriff's office says. Having twice had the opportunity to see Montel discuss his personal experience with medical cannabis and vehement disgust with the drug war's continued assault on seriously ill patients like himself, I would strongly urge drug warriors everywhere to leave him the hell alone. He is honestly one of the loudest and most passionate speakers I've ever seen on this topic. This guy built a career on manufacturing melodrama, so you can imagine how intense he gets when he's in pain and the government continues to prohibit the medicine he needs. The story isn't likely to make major headlines, given that his medical marijuana use was already widely known, but there's a lesson here that I hope won't be entirely ignored. Montel Williams, despite his celebrity status, wasn't immune to the routine and government-approved harassment that medical marijuana patients continue to endure all around the country. What happened to Montel yesterday happens everyday to sick people in America, and very few of them possess the name-recognition to ensure fair treatment or the resources to rebound from the potentially severe legal consequences of a drug conviction. While much progress has been made, the war on medical marijuana is far from over, and its worst victims are inevitably those whose medical needs are the greatest. 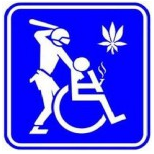 If laws protecting medical patients sometimes become a loophole for recreational users, that concerns me far less than the very real and repeatedly-demonstrated reality that aggressive marijuana enforcement continuously results in the vicious persecution of those who are truly sick. These people deserve compassion and respect instead of handcuffs and a criminal record. The first step is for President Obama to move beyond saying that the war on medical marijuana is a "poor use of resources" and instead admit that harassing seriously ill patients and their providers is just plain wrong. Williams was caught by TSA with his medical marijuana pipe while going through a security checkpoint. He paid the citation of $484 and was released to resume his travel plans. Williams suffers from multiple sclerosis and is a prominent advocate for legalizing marijuana for medicinal purposes. Televangelist and former Baptist minister Pat Robertson makes a cogent argument on alternatives to arresting and incarcerating citizens who use drugs, with a clear emphasis on legalizing the possession of a few ounces of cannabis. Willie Nelson has long been an outspoken activist, so it was no big surprise that soon after his recent arrest for marijuana possession the country music legend and pot aficionado was calling for a national movement to end the U.S. government’s destructive crusade against cannabis. But if Nelson wants to help end pot prohibition, he can do more than inspire the push for reform -- he can help lead it. And one relatively easy way he can do so is by hosting a benefit concert next year to draw attention to the evils of the drug war, using his iconic pop culture status to raise money for those organizations and people that are working to make the dream of reform a reality. A benefit concert next year would be particularly well timed, with the question of whether to legalize pot possibly being put to Washingtonians as soon as next fall and with California and Colorado voters likely weighing in on ballot initiatives of their own in 2012. SPRINGFIELD, ILLINOIS — Former talk show host, U.S. Navy officer, and multiple sclerosis patient Montel Williams will meet with members of the Illinois House of Representatives tomorrow to urge them to vote in favor of SB 1381, a bill that would make Illinois the 16th state in the nation to allow chronically ill patients to use marijuana with the recommendation of their doctor. The Senate passed the bill – which would create one of the tightest regulated medical marijuana programs in the country – last year. Since 1996, 15 states and Washington, D.C., have passed medical marijuana laws, and more than a dozen others considered such laws in 2010. The most recent was Arizona, where voters approved a medical marijuana law earlier this month. Under SB 1381, qualified patients could obtain medical marijuana from state-licensed organizations regulated by the state health department, which would also issue medical marijuana ID cards to patients who receive a recommendation from their doctor. Public use of marijuana and driving under the influence would be prohibited. In Illinois, the bill is supported by the Illinois Nurses Association, the AIDS Foundation of Chicago, Protestants for the Common Good, the Jewish Political Alliance of Illinois, and Illinois public health advocate and physician to the governor, Dr. Quentin Young. Nationally, the American Nurses Association, American Public Health Association, American Academy of HIV Medicine, and the Leukemia & Lymphoma Society, and many other esteemed health organizations have endorsed the medical efficacy of marijuana. "High Society," an exhibition opening today at London's Wellcome Collection museum, examines the history of opium, from pre-biblical practices to today's entire prohibitionist drug market, which is worth an estimated $320 billion per year, according to the United Nations. One of the aims of the exhibit is to de-stigmatize today's illegal drugs and show there is more to the subject than visitors may have thought. After all, substances that many people ingest freely today — alcohol, caffeine and tobacco — have all been criminalized in years past or are still illegal in some parts of the world. It's easy to say and easy to document, but quite difficult to really internalize, the human suffering and the outright absurdities wrought by our 40-year-old war on drugs. Sometimes it takes a picture to drive the point home. The Drug Policy Alliance has teamed up with award-winning artist Ricardo Cortes to produce an engaging, eye-catching 2011 wall calendar about the history of drug prohibition in the United States. Proposition 19 would make California the first state to legalize marijuana, and plenty of celebrities have voiced their support.